3. A. Burkovska, T. Lunkina. Banking system of Ukraine: the features of the present activity. 10. I. Kiszczak, N. Korneva, O. Novikov. Ukrainian livestock in global industry development. 22. O. Vyshnevskaya, T. Liskovetskaya. Globalization influence in the formation of the state environmental assessment criteria. 33. O. Melnyk. Venture capital as a factor of innovative entrepreneurship in the agrarian sector. 41. I. Barishevskaya, A. Korabahina. The legislative and practical aspects of accounting and authorized capital of commercial banks. 49. A. Sokolova, T. Ratoshnyuk. The impact of transformation processes on the agrarian sector’s efficiency. 62. I. Melnichenko. Stocks of budgetary establishments: some issues of their reflection in accounting. 68. A. Bogoslavska. The formation of the economic development policy of protected areas and the objects of natural reserve funds. 77. V. Ribachuk. Innovative model as institutional bases of efficiency and competitiveness of economy. 85. V. Pekhov. Innovation grades in production of grainagricultural enterprises. 93. G. Hospodarenko, I. Rassadyna. Photosynthetic activities of plants false flax spring depending on fertilizing in the Right bank steppe. 100. S. Hrytsayenko, А. Datsenko. Photosynthesis’ productivity of buckwheat by the influence of biological preparations. 107. R. Vozhegova, L. Muntian. The influence of different doses of nitrogen fertilizers and seeding rates on the structure elements of harvest of winter wheat..
116. M. Shevnikov, O. Milenkо. Interspecies competition and weediness of soybean crops depending on agrophytocenosis model. 124. O. Samoilenko. The influence of spring barley ecotype on its yielding capacity in the conditions of the Left-Bank Forest-Steppe of Ukraine. 131. S. Obrajey. Crop yields depending on the basic processing systems and levels of fertilization in the crop rotation of grain in the Central Forest-Steppe of Ukraine. 143. I. Cherednichenko. Waterproof strength of structural units of typical chernozem in organic farming. 153. S. Kirienko. Creation of fertility restorers of sunflower resistant to the herbicide express 75 v.g. 159. M. Gill. 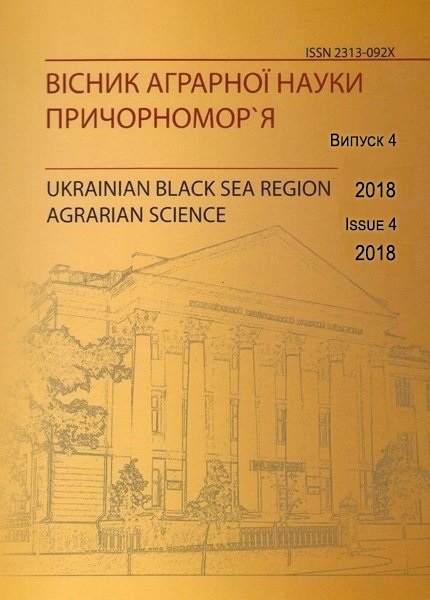 Analysis of milk productivity and effect of selection of cows of different breeds in the conditions of farm “Kolos-2011” Mykolaiv region. 171. Y. Kiriyak, M. Tyshchenko, I. Gorbatenko. Factors of global warming in Kherson region and features of eukaryotes’ metabolism under these conditions. 182. O. Starodubets. Effect of different water types on the fertilizing capacity of boars’ sperm during its dilution. 188. A. Kornienko. The efficiency of the use of artificial insemination in the trotting horse breeding of Ukraine. 197. H. Ivanov, P. Polyanskiy. Calculation and choice of transitional landings. 211. D. Marchenko. Tribological research on the process of wear of a friction pair «cable block – rope» considering rolling slippage. 222. O. Kyrychenko. Electrodynamic stability of isolatorsand bus bars in a short circuit. 228. O. Khvoshchan, A. Tindyuk. Justification of charging circuit options of electric submersible devices. 236. D. Babenko, E. Gorbenko, N. Dotsenko, N. Kim. The reserch of the qualitative composition of the vegetables and melons crushed mass. 242. V. Streltsov. Mathematical modelling of the seeds pressure process in the oil screw press. 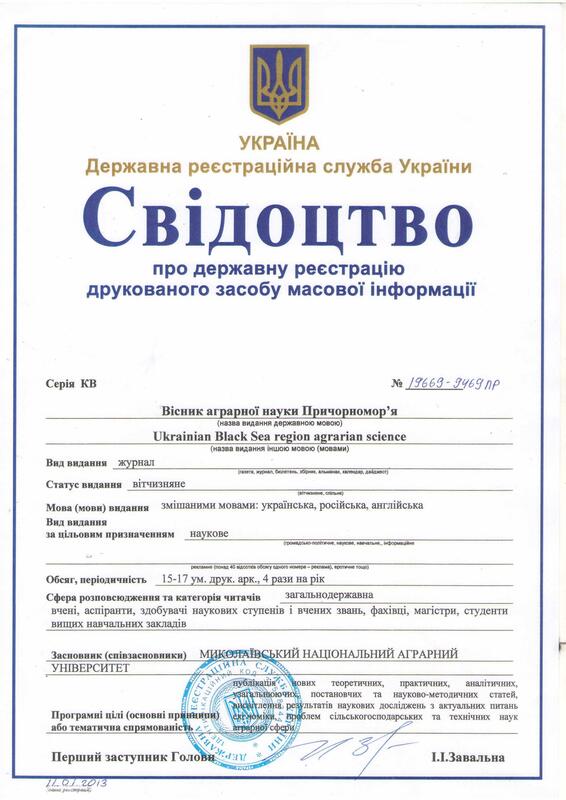 ← Налагодження комплектних електроприводів з лінійним і нелінійним коригувальними пристроями.